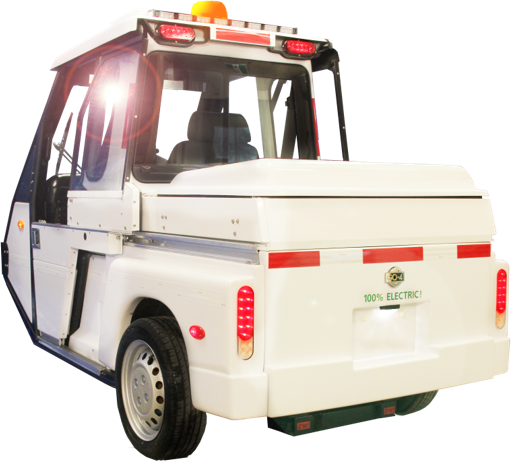 Proud to announce our 100% electric vehicle, the GO-4 EV. Built on the same platform this vehicle inherently has all the benefits of the GO-4, sizing remains identical to the gas model GO-4. Offering plenty of power and range from its 96 Volt Lithium Ion Battery. The battery pack is 20.2 KW with a 55 peak HP AC electric motor. Charges on 110V or 220V, uses a standard J1772 electric vehicle plug. 220V charges in 5-7 hours while 110V can take 10-14 hours. With an onboard 3.3kw charger. Range varies depending on usage, overall we experience 55 to 100 miles per charge. Many factors effect range such as terrain, using electric heat or AC, and of course battery care. In many states you can charge a full cycle for under $2.00 per day. San Francisco, Santa Monica, Sacramento, Portland, Pacific Grove…..
12V DC accessory port for phone, radio, etc. The manufacturer’s estimated cruising range for the GO-4 EV is a maximum of 100 miles, based on measured range tests at our facility in Manitoba, Canada. We are in the flat prairie terrain, tests were completed in varying temperatures of 35-75F degrees. Actual range will vary. Some of the factors influencing range include driving conditions, terrain, speed, vehicle load, use of air conditioner or heater, tire inflation, acceleration and braking, and battery temperature. Combined these factors can decrease driving range by as much as 50 percent. In fact, battery temperature alone can decrease range by 15 percent in extremely cold conditions. Keep tires properly inflated. Low tire pressure reduces range. Avoid unnecessary loads. Weight reduces range. Slow down in wet conditions. Wet and muddy roads increase rolling resistance and decreases range. Lower the heater or AC when cabin reaches a comfortable temperature and recirculate air to maximize efficiency. Using the heater or air conditioning continuously at the highest setting can reduce range by as much as 40 percent. Perform annual battery checks, see owners manual. Balance the battery monthly by allowing the battery to remain plugged in over preferably a long weekend. The on board battery management system continues to balance high and low batteries after the standard charge is completed. Do not leave AC, radio, lights running if not actually needed. Avoid hard acceleration unless required. As an EV user, you can have a great influence on the actual range achieved. Smooth acceleration and minimized use of accessory loads, such as the heater, will greatly increase your range between battery charges. As an example, driving at a constant speed, which puts a stable load on the battery, is much more efficient compared to driving with hard acceleration and braking.